Paramotoring Accidents: Avoid doing this at all costs! If you're thinking about learning how to fly you may be stuck wondering how to transport a paramotor. When you see how big a paramotor is you'll probably think that you'll need a van or a trailer, right? 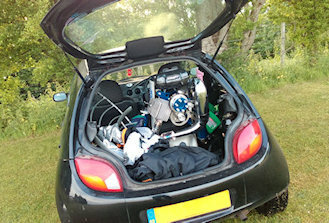 Well you'll be surprised at how easy it really is to transport a paramotor even in the smallest of cars. Here's how you do it.. When manufacturers design paramotors they know that people will need to easily transport them to and from their launch spot. You'll find that the majority of paramotors will have a removable cage so you can transport them in small vehicles. You can also remove the propeller with just a few bolts to make them even smaller. If you take a look at the main picture above you'll see that I regularly used an average sized car to transport my paramotor. As mentioned above I would remove the cage and propeller, everything would then fit in the boot space alone. This meant that I didn't have to lower the seats and that I could still take the family with me. The only problem with transporting a paramotor in your car is the chance of a fuel spill. If you can stand your paramotor upright, great! But if not you may have fuel leaking from the carburettor, tank cap, or breather pipes. I found this out the hard way and lost 3 litres of fuel through my fuel cap. The fuel slowly dripped through my harness and reserve before soaking into the car seats. And what made it worse, it was my girlfriends car, my ears still hurt now! I learned to always stand the paramotor upright if possible, if not then drain the fuel system and tank. 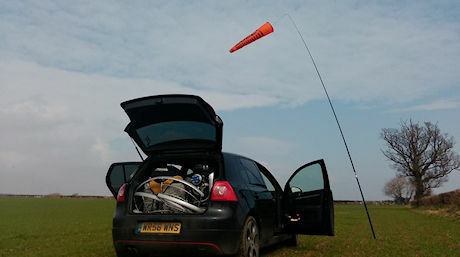 If this sounds like something you wish to avoid, try some of the other options below..
Transport a paramotor using a carry rack! I also bought myself a Thule carry rack that fits onto the tow bar to carry the paramotor on. This is great for times that you need the boot space for other things. Lots of pilots use this particular rack, it came highly recommended and that's why I bought it. I was quite surprised when it turned up, it's tough, sturdy, and comes in at a decent price. It bolts straight onto your tow-bar in about 2 minutes and once it's on it won't budge! See more and check the latest price on Ebay by clicking HERE. Before using the rack I fitted a sheet of plywood to the top of the rack. This lets the paramotor sit safer and prevents it wobbling around. I simply cut the wood to shape and used the already available holes to bolt it to the rack. You'll also want to add a few tie down rings like these that I bought from Amazon > HERE, to ensure your paramotor stays on the rack. This all took me about an hour to do and will be easy enough for anybody with a drill and a jigsaw. Do this and you'll have a great way to transport a paramotor without taking it apart every time you fly. You can transport paramotors in even smaller cars too! So what if you don't have a tow bar, or maybe your car is even smaller than this one? Take a look below and you'll see that I even fitted all of my equipment into my girlfriends ford KA! Well when you've gotta fly, you've gotta fly! I did have to put the back seats down this time, but there was still space on the front seat for any extra items. So you can see that even the smallest of cars are big enough to transport a paramotor. But what if you don't want to put the paramotor inside your car? Maybe you don't want to risk a fuel spillage, or two stroke oil dripping from the exhaust onto your carpet.. 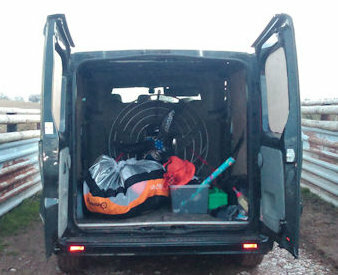 The best option to transport a paramotor will always be a van. If you have a family like myself you may be reluctant to buy a van, but you do have options. The van pictured above and below is a crew cab with seven seats. 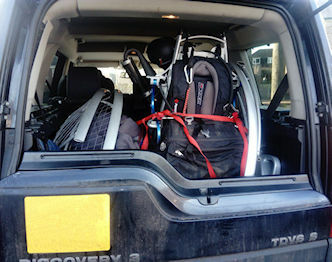 So I was able to transport a paramotor, and the family, and I still had lots of space left! This worked out great when it came time to attend fly-ins and meat-ups. I was able to fit in all of the paramotoring equipment, our camping gear, food, and the whole family. The only problem with the van was that it was terrible off road, not ideal when driving in soggy fields during the winter. So I'm now using a Land Rover discovery. My paramotor easily fits into the back with the cage and propeller removed as you can see below. One more option available to you is a trailer. I haven't tried this yet but I've seen it done lots and I'm actually tempted to try it. You'll be able to stand the paramotor in the trailer in one piece and all you'll need is some tie downs. This leaves the car free for other things, and you won't have to worry about fuel spills etc. I have a trailer so if/when I try this I'll update this article with some pictures. So you've checked out some of the ways to transport a paramotor and you can see there are many options. If you have any other ideas please share them below and I'll add them to the article. 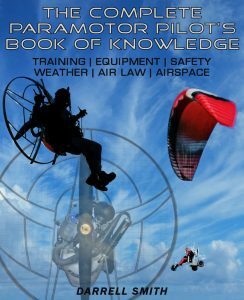 If you're new to paramotoring, find out exactly how to choose your equipment starting with your paramotor >HERE< and then your wing > HERE. 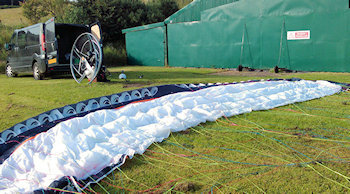 Find out how to enter the wonderful world of paramotoring and avoid lots of newbie mistakes > HERE. 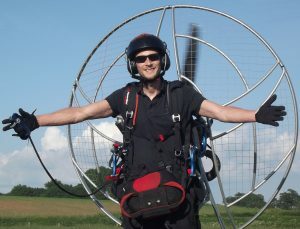 And find out exactly how a paramotor and wing works > HERE. Will definatley keep your site as an invaluable resource. Thanks Matt, and good luck with your training, Spain is an awesome place to fly!